Ready to see my recent thrifty finds? My office organization project is still underway despite getting a little sidetracked! Happy Friday! Today I’m working on putting my office closet back together. If you haven’t invested in closet organizers yet, I think they’re a must. When you take a look at how much stuff came out of that small-ish closet, I think you’ll be convinced! After going through everything, I ended up with a large garbage bag of recycling, a small box of items I took to our local thrift shop and another bag of outdated fabric samples that I’m passing on to my cousin who makes quilts. Once the closet was empty, it revealed scuffs and dings, and I decided it’s probably a good time to freshen up the paint. Weather pending (we’re getting a dump of snow right now), I’m heading into the city today to find some new storage solutions. 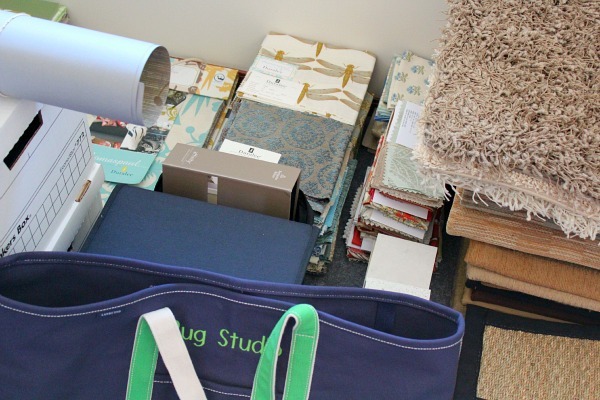 I’m quite proud of myself for staying on task (but it’s hard not to when there are fabric samples, rug samples, boxes and a bunch of other stuff practically swallowing my desk!). Earlier this week, I was finalizing flooring choices for a client in a neighbouring town and the store happened to be right beside a thrift shop. I couldn’t help myself and popped in. I was thrilled when I noticed the deals of the day. First of all, their books were $3 for a shopping bag full and I managed to find quite a few books I’d like to read. I’m one of the few people (apparently under a rock) who hasn’t read Eat, Pray, Love and, although I’m only 50 pages in, I can see why it’s a popular read. Although I find paperbacks a bit more convenient, I like hard covers for their visual appeal. In our family room, I have a collection of hardcovers (jackets removed) on the book shelves and I love the punch of colour they give. Being surrounded by books makes me happy! In addition to the books, I also found a couple pieces of milk glass (or look a-likes) and two small vases. Combined with the books, my total bill was a whopping $4.50. Later in the week, I stopped in a local window treatment store to look at samples for a home I am currently working on. When I was done, I just had to check out what was new in the thrift shop next door, as I do almost every week (I also wanted to drop off the box of stuff from my office closet). My heart started racing when I saw a Bergere chair through the window, but of course it had a sold sign on it when I took a closer look. 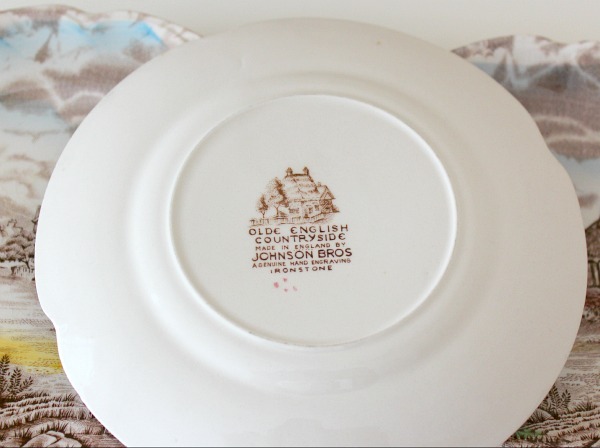 After looking around for a while, I found a few ‘Olde English Countryside’ pieces that I found intriguing for $2.25. I have seen these dishes on Ebay and knew they were a steal. I haven’t decided what I’m doing with them, but I couldn’t pass up buying them (okay, I know this goes against my organizing principles). 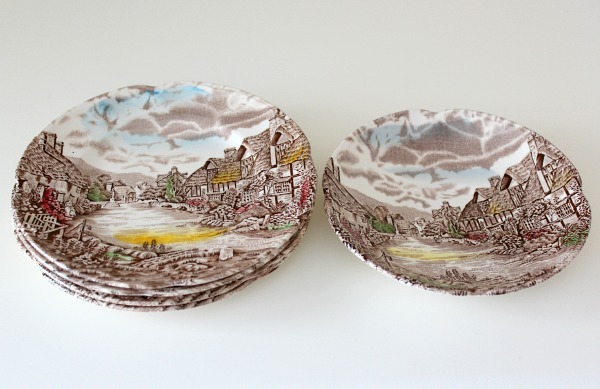 I’ll probably give them to my friend who adores this sort of thing (she also likes milk glass, but there’s no way I’m giving those pieces up!). After all was said and done, my total thrifting amount for the week came to $6.75. Where do you like to shop for great deals? Are you a thrift shop frequenter, a flea market gal or more of a garage sale peruser? I’d love to hear about some of your best thrifty finds! Great finds, Shauna! I had to share this with you…I was at a client meeting the other day, and she was showing me some furnishings she had found. One at a second hand store was a great little side table with carved legs, and all I could think of was how much I wanted to paint it!! And the other was a Broyhill Cherrywood end table that was found at the dump! For free, and in such good condition, I couldn’t believe it! Just goes to show you can find great stuff anywhere!! Free is even better! I was at a showhome in the fall and they had just sold it and were cleaning it out for the new homeowners. They were just going to throw out some of the staging stuff, including pillows and a few other items and I took them home instead. Good deal for me! 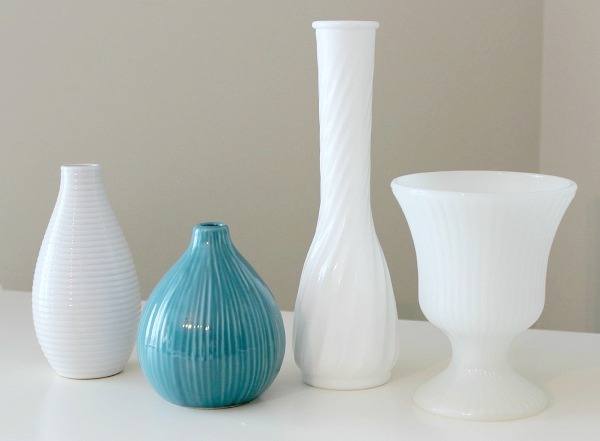 Love your finds Shauna….I am milk glass addict also. I just got home from a junking excursion to some of my favorite local shops, and I found some interesting vintage biscuit tins that are going to be my new jewelry line, and of course lots of vintage rhinestones my very favorite thing to find! Can’t wait to see what you come up with! Thanks for stopping by and enjoy your weekend! Great finds! I love the vases! 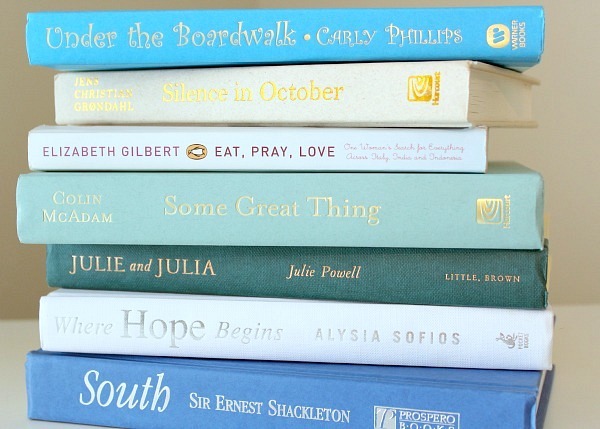 I like to buy the books, but for the color of the hardbacks! Sadly I hardly ever read books! Just blogs online mags, and real mags! By then I am to tired to pick up a book and read! I used to read a lot and then I went through a phase where I was tired from reading blogs and magazines, etc. Now I’m getting back in to it and I’m wondering why I ever stopped! I’m a reader! Love those finds! Those vases are beautiful and perfect for spring flowers! I myself shop for bargains all over the place. My favorite of course is TJ maxx, but I also love yard sales!